Inspiration constantly comes to me from so many different places, I can never find enough time to see to fruition even half the projects and designs I dream up. However it is great to be given a client's inspiration and find it really sparks my imagination. So I thought I would share two recent cakes, (very different ones but both enjoyable to make) where the client had specific reference for me to work from. The first is for a 21st birthday cake. this was a bit of a last minute cake as the lady had been let down by her first cake maker. Over the phone she said that the birthday girl didn't like bright colours but preferred pastels. I asked if she could send me some reference as I needed a bit more to go on, thinking I would see some pretty pastely florals, I really wasn't expecting romantic vintage. 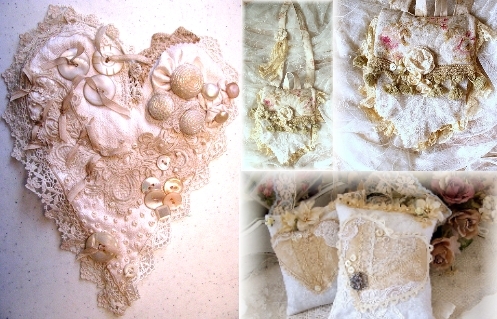 The heart with buttons is by kbaxterpackwood. The other three images are by Kimberly Ann Ryan. However I was delighted as I knew I would be pushed to try something a bit different. 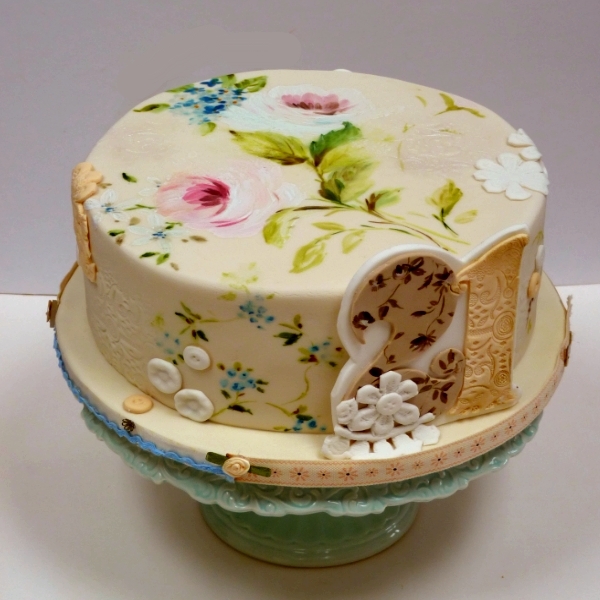 I have seen some beautiful cakes using button and lace moulds, and I had just enough time to order some over the internet. I wanted the cake to have a patchwork feel but with no hard edges, so I embossed some areas with the lace and then brushed pearl lustre dust over it. 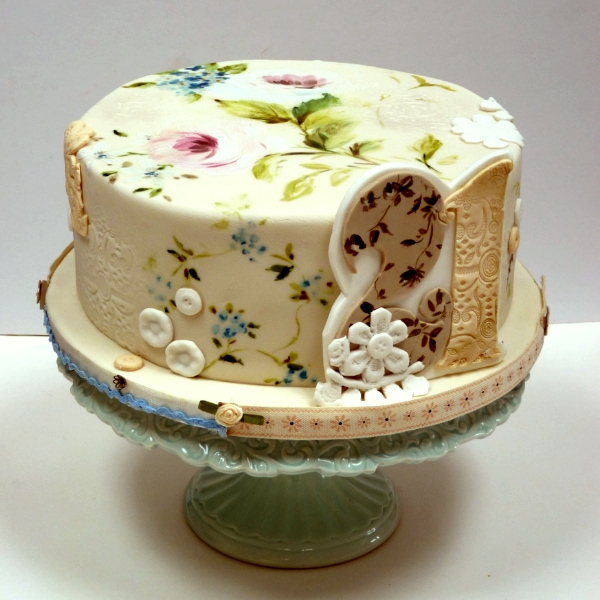 She didn't want the cake and flowers to be too pinky which is why I tried to make them as vintage as I could. I also dabbed off some of the painting to give an aged look. 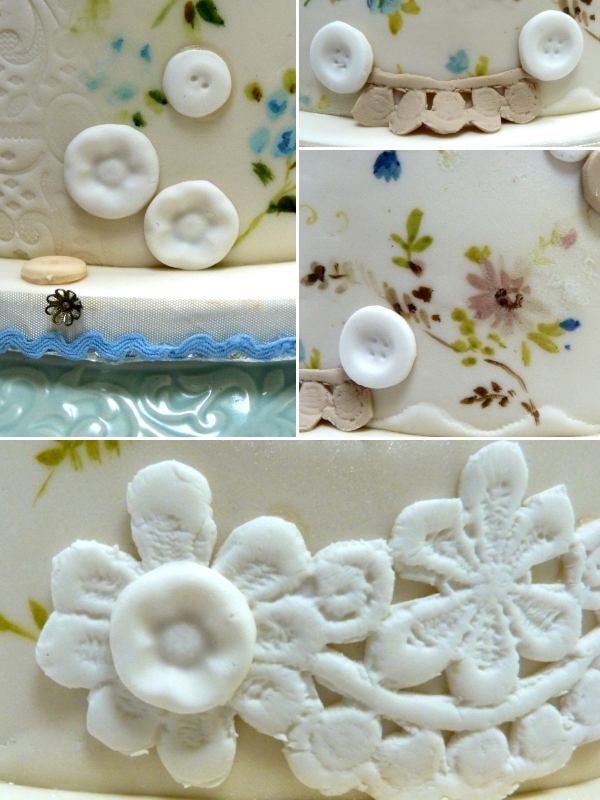 I then added sugar buttons and lace over the cake for an extra dimension. 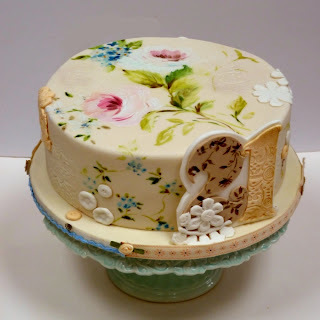 It would have been a shame to finish this cake off with a plain ribbon so I mixed and matched various ribbons round the cake board with some other embellishment. I was really pleased with the result and am hoping to create a tiered wedding cake like this soon. I shall post the next cake tomorrow. That is beautiful! 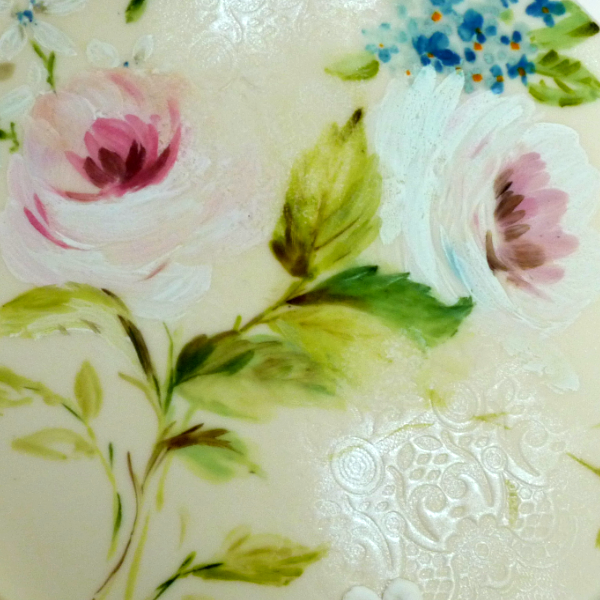 Reminds me of an Ascot hat - fantastic brushwork on the painting of the flowers. Wow, I think this is my favourite cake that I've seen of yours! Семпла и красива ,чудна е !